Case must be at least 13"
Carrying capacity up to 70 lbs (32 kg). 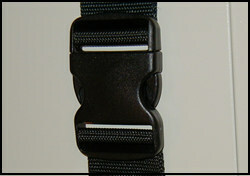 2" buckles make it easy to buckle and they are VERY strong. Design Note: The straps are folded under the buckle so the plastic buckle doesn't contact and potentially scratch the side of your case. 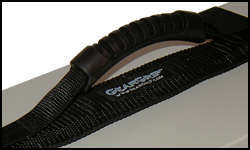 Premium handle has a soft grip and is flexible to conform to your hand. Aluminum spreader imbedded in the top strap keeps the straps properly separated. High-quality carabiner-style snaphooks on the shoulder strap, look and function great. 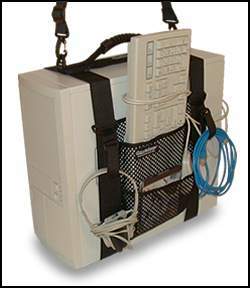 The CableGrip uses hook and loop material to securely attach LAN cables, power cable, headphones and more. 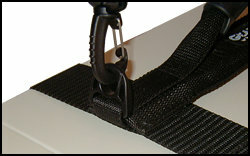 The CableGrip can be moved up and down the straps. The nylon GearBag has two pockets to hold your keyboard, mouse and a couple CDs. 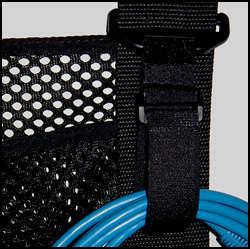 The GearBag is also adjustable using hook and loop material.